Jonathan Darlington was music director of the Duisburg Philharmonic until 2011 having graduated from Durham University and the Royal Academy of Music. He began his career as a freelance pianist and he made his conducting debut in 1984 at the Parisian Theatre de Champs Elysees. 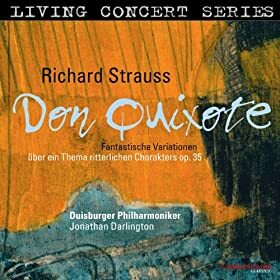 He remains a Laureate of the RAM and also holds the position of Fellow of the RAM and here conducts the Duisburg Philharmonic Orchestra in this stunning performance of Richard Strauss’ tone poem, Don Quixote.